Home care organizations looking to grow in today’s market require a vision that is unique, defendable, and sustainable. They must erect the infrastructure to support that vision, which includes the people of course, but also needs to include technology. Many service provider agencies grapple with the need for change, while not compromising their business-as-usual work that has kept the lights on all these years. At AlayaCare, we try and view the home care world through the lens of a service provider. There is no single solution that completely gives an agency the freedom, flexibility and speed to keep up with innovation. Agencies of the future have a unique opportunity to help build that ecosystem with partners such as hospitals, health networks, software vendors, application providers, and novel start-up companies. This is why AlayaCare introduced the “AlayaSphere”. 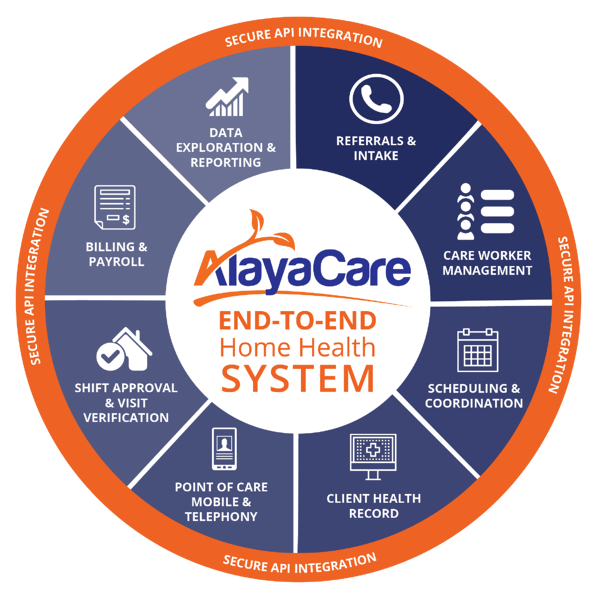 AlayaCare is a cloud-based platform equipped with APIs and the ability to support third party integrations; it is the closest thing to a true platform in home care and provides a combination of functionality, flexibility and efficiency. No home care software solution is built perfectly to suit every organizations unique needs. Many agencies use a number of different solutions and are forced to collect, access and analyze multiple different sources of fragmented data. For example, an agency might be using an HRIS system for employees, a CRM for sales and development, an EHR for client records, QuickBooks for accounting and a software for scheduling. It’s increasingly important for providers to have systems in place that give them quick access to accurate information. Having the ability to deliver and exchange new data to stakeholders and systems of all sizes and capabilities for their own use and interpretation—or in other words, interoperability—can dramatically increase the quality of care. With AlayaCare, we can build an API that allows your agency to get consolidated information from multiple systems in one place. We’re allowing clients to use our product in a way that best suits their needs. AlayaCare users can integrate their various partner applications custom to their needs, removing any barriers between data sources. The digital world changes fast. That’s not just true of new software offerings, but also in maintaining business continuity. Keeping up with competitors as they adapt and modernize their systems is only part of the equation. Proactively addressing healthcare regulatory changes and mitigating risks is another. With an open API system like AlayaCare, agencies can quickly pivot to keep up with these changes. They can also seize emerging opportunities more quickly with a flexible interface. This opens agencies up to finding the best and most cost-effective tools without disrupting their user experience. An increased emphasis on quality and outcomes is driving the need for innovation. The healthcare landscape is evolving with new models of care, reimbursement rules, virtual care, consumer-first care, and delegation of authority to name a few. In short, the industry is poised for considerable disruption. It’s nice to imagine a provider’s needs can be put in a neat box, but the fact is that clients will float back and forth across the continuum of care, and their data should do the same. Technology plays a big role in adapting to the new reality. That’s why today we see wearables, artificial intelligence, remote monitoring, and predictive analytics on the upswing: because they are key to a lasting vision and a unique service delivery. Agencies of the future have a unique opportunity to help build an ecosystem with partners such as hospitals, health networks, software vendors, application providers, and novel start-up companies – and that’s exactly what AlayaCare is hoping to achieve through the AlayaSphere. AlayaCare has all the characteristics of a flexible solution and is well suited to be a long-term partner that can help your agency scale for growth and the future of the home care industry. 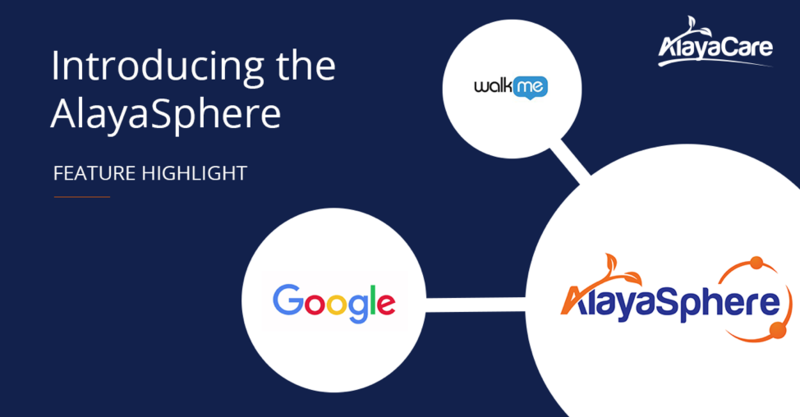 Check out the AlayaSphere listing page to learn more about our current integrations and start increasing interoperability today.